Find the date of creation of a Facebook profile or page. Learn a method of finding when a profile or page was created on Facebook. Over a billion people are using Facebook. There are real people on Facebook and there are fake profiles as well. So, for more than one reason it may become important for you to know when a particular Facebook profile or page was created. If you have a competing Facebook page –you might want to compare its success with yours but age of pages also matters a lot. Older pages are likely to have more followers than relatively newer pages. Before accepting friend requests, it is useful to find out when that Facebook profile was created. Such a practice will keep you safe from fake profiles, which are newly created and then soon removed (or gets blocked by Facebook). But, unfortunately, so far, Facebook does not clearly display the date of creation of a page/profile. The only place this information resides is the bottom of Timeline. However, in case of profiles/pages which are several years old and have been updated regularly, it is very tedious to keep going down the Timeline in search for the “Joined Facebook” message. Here we explain a little trick which can easily tell you the approximate, if not accurate, date of profile/page creation. Go to the Timeline of which date of creation you want to know. See the date when this photo was posted. This could be the date on which or around which the Facebook profile/page in question was created. This method relies on the practice that Facebook offers the option of uploading a profile picture at the time of account creation and mostly people do upload a profile picture. 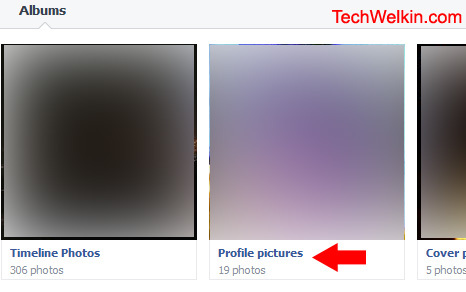 This method assumes that the owner of the profile/page has not deleted the first profile picture. Therefore, it is a fairly loose method but it can give you an idea about the age of the profile/page. I hope you liked this work around tip on how to find when a Facebook profile was created. Do let me know if you’ve any questions. Thank you for using TechWelkin. It doesn’t always right. I remember my account was created in February 2009, but I don’t remember the exact date. When I created my account, I didn’t set profile picture immediately. A few months later, I set my first profile picture. So, I can’t take the date of my first profile picture, can I? And thus, this way doesn’t work all the time.